As your child grows, so do their taste buds. They are more aware of what they like and what they don’t like but they are also more willing to try different foods. Again with this age, variety is key to a healthy nutritious diet. As their independence grows, they will be making far more food choices on their own. It is still important to encourage them to eat healthily and sitting down and eating together can help instil these principles. 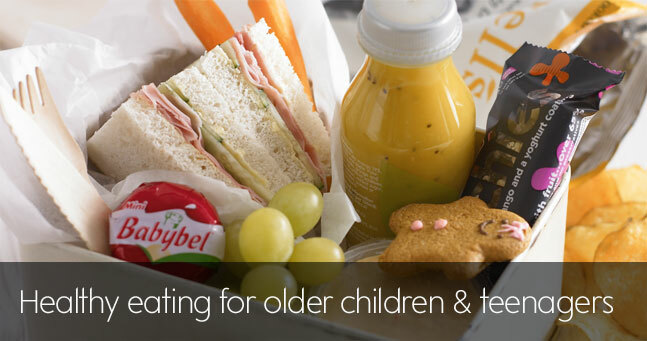 Older children may enjoy shopping with you and helping to make food choices for the family. This is a great way to teach them about food labels and how to interpret them. Cooking together or even encouraging older children to cook for the family, is a great way to encourage a healthy relationship with food. Older children and teenagers should base their diet on the 4 main food groups. Eating well will help them perform at school and in sporting activities. This food group includes foods such as bread, breakfast cereals, potatoes, pasta, rice and oats. These foods provide children and teenagers with energy as well as providing B vitamins and fibre. Try to include at least one of these foods at each meal time and if possible choose wholemeal varieties like wholemeal bread, brown rice or wholemeal pasta. It is important to eat breakfast. Older children and teenagers are often on the go at this age so if there is no time to sit down and eat breakfast, make sure you give them an ‘on the go’ breakfast. This could be a cereal bar and a piece of fruit, a squirty yogurt and a couple of oatcakes or a fruit smoothie made with yogurt. Numerous studies have shown that children perform better at school when they have eaten breakfast. Fruit and vegetables provide many valuable nutrients, important for a growing child or teenager. Try to encourage your child to eat at least 5 portions a day. Eating a variety of different coloured fruits and vegetables provides a variety of valuable nutrients. Remember, fresh, frozen, canned and dried all count towards 5 A DAY. Fruit and vegetables make great snack food, so try cutting up a selection of vegetables or making a fruit salad to give to your child when they are ‘on the go’. For some easy ways to get 5 A DAY into your child’s diet, click here. Milk and dairy products such as yogurts, cheese and fromage frais provide your child with a great source of calcium which is important for growing bones. They also provide fat, protein and other nutrients such as zinc and vitamin A. Children and teenagers should try to consume around 3 portions of dairy a day. Calcium comes mainly from dairy products in the diet. It is particularly important that children and teenagers meet their calcium requirements because their bones are still growing and developing. Up to 90 percent of peak bone mass is acquired by age 18 in girls and age 20 in boys, which makes youth the best time to “invest” in your bone health (BNF 2012). There are alternatives to dairy products which can provide useful amounts of calcium. For more information click here. These foods provide protein which is important for growth as well as iron, vitamin D, zinc and B vitamins. Oily fish is also a source of omega 3 fats which is important for brain and eye health. Of course meat and fish are the most obvious proteins, but there are plenty of other good sources. Eggs, beans, lentils, pulses, tofu and meat substitutes like soya mince are alternatives to meat. Meat is a good choice for providing iron, but many older children and teenagers may choose to avoid meat. Non meat sources of iron or non heam iron can be obtained from eggs, lentils, green leafy vegetables and fortified breakfast cereals. Non heam iron is harder for the body to absorb but you can assist its absorption by consuming vitamin c rich food such as citrus fruits or orange juice with your meal. It is particularly important for girls to get adequate amounts of iron in their diet once they have started menstruating. Dietary surveys have shown that adolescents in the UK have low levels of iron in their diets which can have consequences for health. Controlling what your child eats is not an easy task at this age when independence is growing. But encouraging your child to eat healthily and to limit their intake of foods high in fat and/or sugar is something you can do. National surveys indicate that overweight and obesity is prevalent in British adolescents. Encourage your child to make healthier choices over foods high in fat and/or sugar by giving them healthy snacks to consume during the day. Here are some ideas you can sneak in to their school bags! Try to limit your child’s consumption of soft drinks containing sugar. As well as being high in calories, they also promote tooth decay. Try swapping to sugar free versions and encouraging consumption of water. Giving them a bottle of water to take to school may lessen the urge to grab a sugary drink. Try these great recipes for some ‘not so bad’ treats. Easy enough for your teenager to make too!